This unusual action allows eight counties within California to establish a separate system of student and teacher evaluation. Secretary of Education Arne Duncan earlier rejected California’s statewide waiver application. The key reason was the state’s refusal to tie teacher evaluation to student test scores. Teachers’ unions in all eight counties argued against the odd action, saying it “weakens a comprehensive and coherent approach to improving our public education system” and creates “a privatized ‘shadow’ system of education in California, making students susceptible to market exploitation and profiteering.” Unions in California and beyond are now protesting the decision, citing lack of engagement with teachers, parents and other stakeholders in planning and implementation. Joining the protest nationwide is the Badass Teachers Association. Badass Teachers now number over 25,000 – up from 21,000 when the group was highlighted on the July 11 edition of the Education Town Hall. Pearson, the giant testing and educational corporation, apologized on August 13 for errors in standardized test reports across the Commonwealth of Virginia. The Virginia Alternative Assessment Program evaluates students with significant cognitive disabilities. Pearson’s statement said that the reporting error affected 4400 students and that the company learned of the error on July 29. According to the Washington Post, families in several school districts – including Alexandria, Arlington County and Prince William County – received incorrect reports before the error was discovered. Virginia’s 3-year, $110 million contract with Pearson began in 2011. Pearson and Commonwealth officials were expected to meet this week to discuss financial compensation as a result of the VAAP error. Pearson’s 2012 annual report notes flat revenues in their overall assessment business but a 10% increase in on-line testing revenue. Pearson earns over 500 million British Pounds from its North American Education enterprise alone. The full international operation earned over 6 billion British Pounds in 2012 with profits of 950 million pounds, up from 600 million in 2008. Meanwhile, the Campaign for Artful Resistance – which asks communities to recall and celebrate what they once loved about school that has been lost in the push for high-stakes testing – is ramping up. DC-area events are already scheduled for Sept. 14 (Montpelier Art Center) and Sept. 15 (Long Reach Village Center). More are in the works. The Education Town Hall is collaborating with local artists and other community members to craft additional Artful Resistance. Please join us in this effort. Contact Thomas.Byrd at Yahoo.com for more details. If you haven’t tried lately to get an education without succumbing to the School-to-Prison Pipeline, be sure to try your hand at the ACLU’s School to Prison video game. See what happens – and how limited your choices – when you bring a cellphone to school one day, due to a family illness, and begin the long, but amazingly quick slide down the pipeline away from an education and future opportunities. This graphic representation of School-to-Prison Pipeline organizes facts in a format that is easy to read, understand and share. Please take a look…. and the #DoSomething! 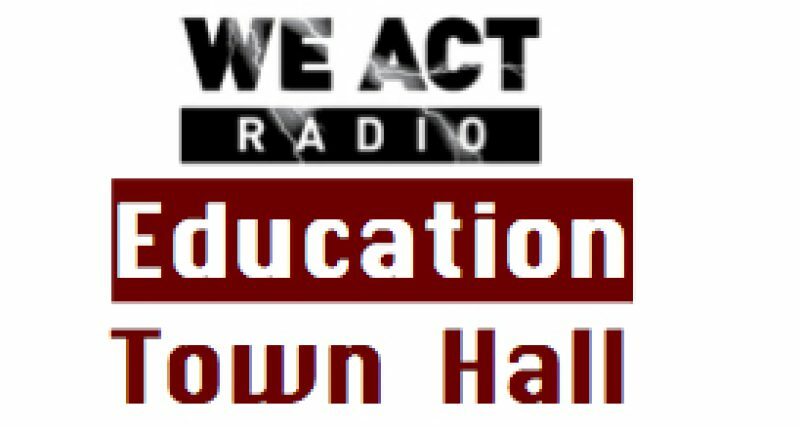 August 15 edition of The Education Town Hall on We Act Radio.